Will Hamsters Chew Through Cardboard Boxes? Cute, cuddly and fascinating pets, hamsters survived for centuries in the wild regions of Europe and Asia Their survival skills include running, digging, nest-building and food-hoarding. Hamsters have strong teeth and are fabulous chewers. In fact, for hamsters, chewing is an absolutely vital activity. One thing all potential hamster owners need to keep in mind is that hamsters love and need to chew. Aside from requiring strong teeth to crack and chew food that can be tough and fibrous, hamsters need their teeth to break through material they can use for nests and shelters. Hamsters are social with their owners, but they crave privacy and security. Their strong teeth and great digging and building abilities help them create enclosures that keep them safe and hidden. Hamster owners need to remember that a hamster's teeth never stop growing. As a result, chewing is an absolute necessity in order to ensure a hamster's teeth do not become too long, presenting serious problems. 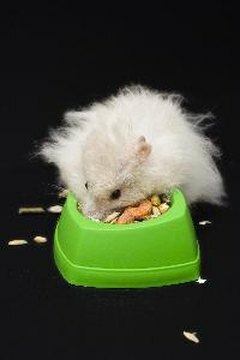 Accordingly, organizations that provide good information about hamsters as pets, such as the ASPCA and RSPCA, advise making plenty of safe chew toys and chew items available to hamsters regularly. Chemical-free cardboard is an especially desirable material for hamsters. Most cardboard paper towel rolls and toilet paper rolls are not very thick. Those that do not contain glue residue or chemicals are great fun for hamsters; they'll play in a roll, chew it to bits and use the remains as nest material. Cardboard box pieces also serve as chewable items for hamsters; if the box is fairly thick, your hamster may view the box as a chewing challenge. Small boxes can serve as shelters and gnawing material. A small box containing a hamster-size hole, placed in a hamster's enclosure, will serve as a protective den; your hamster might push it into a private corner nest there. The hamster may nibble on the box if it is cardboard, but having other chew toys and treats in the enclosure on a regular basis will likely reduce the desire for a hamster to chew up the box shelter. You can always replace a dilapidated structure with a new one. If you need to carry a hamster from place to place, a thick cardboard carrier is probably fine, but it may be a good idea to search for a carrier made of a sturdier, unchewable material if you need to transport your hamster fairly frequently. Be sure that any cardboard introduced to a hamster is safe and clean. Jeff Katz has been a professional librarian, educator, historian, writer and editor for almost 20 years. He holds a Master of Library Science degree from the University of British Columbia and a BA degree in Classical Studies from Hunter College of the City University of New York. Why Is My Rabbit Digging Holes? Do Ferrets Require Shavings in the Cage? Can I Use a Cardboard Box for a Rabbit Nest Box? What Kind of Conditions Do Hamsters Live In?